This issue wastes no time in picking right up, giving us a great page shot of a giant shark swimming through the air inside the Midtown Tunnel. The shark takes off the entire top half of the taxi cab that both Peter Parker and Mary Jane Watson Parker are riding in. They're on their way to Queens to check in on Peter's Aunt May, hoping that area isn't as bad at Manhattan. Peter actually punches out the shark all without the driver seeing and they keep moving on with their day. I guess things are just that easy when your life is a comic book. Back at Empire State University, we see a struggling Dr. Curt Conners in his lab trying to fight off becoming the Lizard. He's supposed to be able to control the transformation but something is not letting him grab control over it this time around and he transforms without wanting to. Pete and MJ finally make it to May's house and the groups just miss each other, May isn't home and as Peter leaves as Spider-Man in worry, May arrives at home, telling MJ she tried to leave for Manhattan. On the other side of the city, another car shoots across town. Inside are Billy Conners and his mother. They're on their way to go see Curt, he wants to talk about them getting back together and the only reason she agreed was because he said he can control the Lizard. Whoops. Peter makes it back to the Bedford Towers, his place of living and Aunt May isn't there. The only other place she could've gone to see Peter is ESU, where he goes to school. Speaking of which, someone is just arriving there its Curt's ex-wife and child. The security guard, acting very strange, takes them to "see Curt" in the library but he's taken over by something and let's out creatures from a filing cabinet marked "Ob-occult"! Breaking off to another side story, these two tourist kids who were supposed to be staying at a hotel sneak out and find themselves in the area where Macy's keeps the floats and things for the Thanksgiving Day parade. They find the giant Spider-Man balloon but it starts moving toward them like its alive!!! Back at ESU, the Lizard shows up just in time to fight off the monsters, yelling "They're mine!" little does Martha know, he's not trying to save them, he wants to be the one who kills them! Spidey's making his way to the school when he notices the giant balloon Spider-Man walking through the streets. Figuring that Curt can handle his own for the time being, he goes to take care of the balloon. Killing a balloon proves a lot harder than originally thought, Peter finally figures out that to kill a giant balloon, you need a really big pin, and the biggest pin around currently is the top of the Chrysler Building! And just like that, with a huge POP, the threat from the Stay Pufft Spider-Man is over and done with. Over at the University, the Lizard finally tells Martha that he's going to kill them, mainly because of his hate for Curt. He needs to eradicate all traces of that filthy mammal and that includes traces with blood relation! Luckily, Spider-Man shows up with a well placed kick to the spine and diverts that from happening for a little while. Spidey buys some time, and he needs to get to a chemistry lab so he can make another serum to cure Conners, like he has before. He finally makes the serum and with perfect timing, the Lizard shows up ready to brawl! 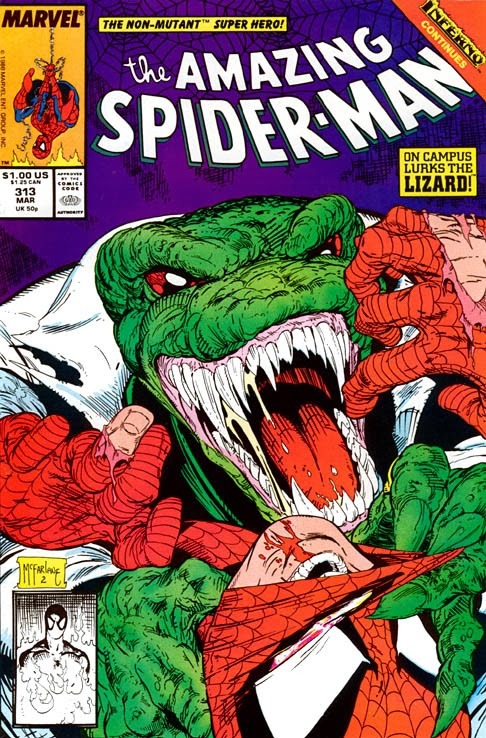 Spidey can't act on his Spider-Sense because the serum needs to be swallowed so he's gotta be slick about it, and he lets the Lizard catch him. Choking him out, Spider-Man tosses the serum in the Lizard's mouth while he's nice and close, but it doesn't work! The Lizard's reptile will is becoming immune to the concoction and isn't letting Conner's come out on top. Since the solution is electro magnetically based, Peter figures a giant electric shock might help boost the serum, but it also may kill the good Doctor. Its a tough decision, but a risk he's willing to take. Ready to zap the Lizard, Billy Conners grabs Spider-Man last minute and pleads with him not to hurt his father. This distracts Spidey long enough for Lizard to make his move and close in on the small boy. The Lizard shocks (hehehe) everyone though and reaches for the giant wire on his own! His left arm reaching for the cable, obviously being controlled by Conners, and his right arm, trying to stop it. He even tries to bite off his left arm, saying how he can always grow another. Spidey steps in and burns the Lizard, giving him just enough of a startle that his left arm could go and grab the cable. A huge zap and finally the Lizard is gone, only left is an embarrassed Curt Conners. Curt tells Martha and Billy they need to leave and not tell him where, he no longer has control over the Lizard. Spider-Man will see to it that they leave the city safely. Outside the school, MJ shows up in a cab and let's Spider-Man know that she's looking for Peter Parker (wink wink, for the bystanders at the school) and she needs to tell him that his Aunt May is safe in Queens and not in Manhattan. Spidey needs a happy ending at this point of the night, but that'll never happen. Especially when, at a minimum security prison in New York, a familiar face and ex-inmate Jonathon Caesar is getting out of jail with the help of a dirty lawyer. And by the look in his eye, he's got a pretty vile plan already gearing in motion for Mary Jane when he gets back to the city! Another fantastic issue by a fantastic creative team. Dave's story telling is impeccable as usual, giving everyone from the main characters to the passerby people equal time in the plot. And let's not even get started on the perfection that is McFarlane. Be back in another week to see where else these two take our favorite webbed hero!